Extraterrestrials have had enough and they are letting us know through Boolean’s cyborg pet, Cylene. He was very receptive, and did what I knew he would do. He asked me to submit an idea for a break-out session. I told him that I wanted to be a participant, and not a presenter, but that felt false even to me. If I truly believe in this, then I need to be active, not passive. It just so happened that this conversation took place on the day when I was filling out a bunch of paperwork for a conference that I have been invited to present at in February in Ohio. As I was describing my workshops for the Dublin Literacy Conference (Digital Picture Books, Using Webcomics in the Classroom and Stopmotion Movie Magic for families), I realized that if I am going to help folks in Ohio think about New Literacies, I owe it to my school and fellow teachers to do the same right here at home. 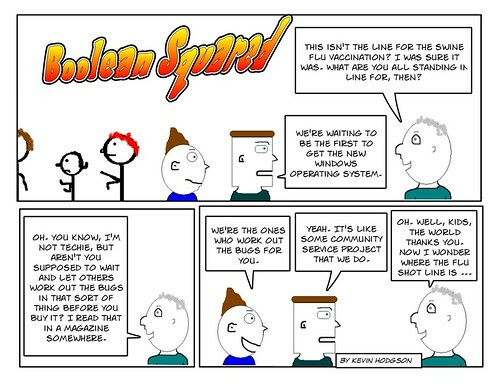 So, I am going to propose a session on using Webcomics as a Writing Tool Across the Curriculum. 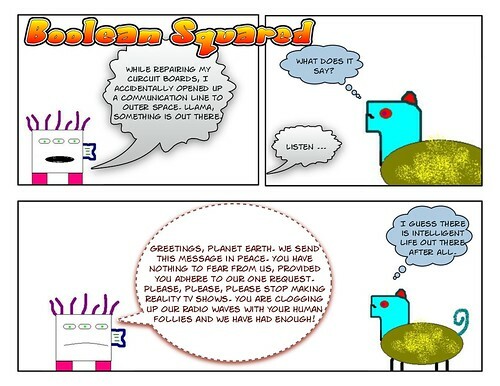 My hope is to set up a temporary ToonDooSpace (note to self: email ToonDoo folks) so that teachers can use a ToonDoo closed network site to experience the possibilities themselves. I’ll let ya know if the school district approves my workshop offer. In this story arc, Funk and Cylene are home alone. When a cyborg says “oops,” you know something is up. The National Gallery of Writing, hosted by NCTE, now boasts 2,136 galleries and 19,395 submissions at this writing! That’s a pretty cool number, so I decided to tour around a bit. There is some wonderful writing in those galleries, although navigation through the labyrinth isn’t so easy. How to set up browsing through the online gallery must have caused a mighty headache for the NCTE folks and they clearly did the best they could. I came at it from my usual lens: are there digital compositions represented in the writing in these Galleries? I’m still not sure, since my search queries mostly turned up empty. I found one that I did (see below) and found a beautiful digital story that my friend Troy did about his family, but mostly, I found … nothing digital. There were plenty of pieces of writing that examined or focused on the world of digital media (I was intrigued by a short story written as Tweets, for example, and filed that away in my head). Part of the problem was that the format for submission did not exactly lend itself to digital compositions. I set up a gallery for digital stories from my students around their Dream Scenes, but abandoned it when I realized that even though the videos were very small, the site would not allow me to upload them directly and embed right there. I would have to go through some hoops, and I didn’t have the time. How many others stopped at that hurdle, I wonder? It seems to me that if NCTE is truly committed to the concept of multimedia composition (as evidence by the strong papers it has put out in the last year), it would have built a system into the framework of the National Day on Writing to allow for folks to easily share digital stories, podcasting, etc. PS — here is the digital story that I submitted to a gallery around teachers with stories to tell. You can see in the gallery I could only fit part of the written narrative and the links to the video and the full story are not even hyperlinks. 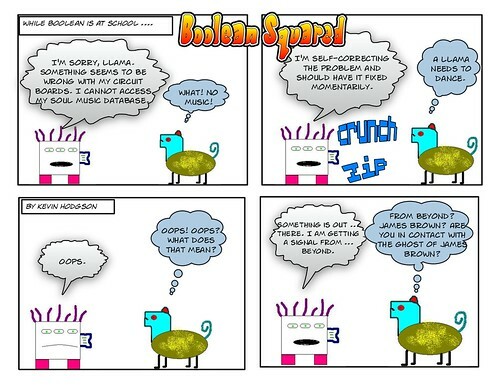 I am trying to bring Funk the Llama and Cylene the Cyborg into my webcomic a bit more. So, for this story arc, I imagine what these two must do all day. Just as background: Funk lives for soul music and Cylene was created out of discarded computer parts, with a soul music database inside of her. 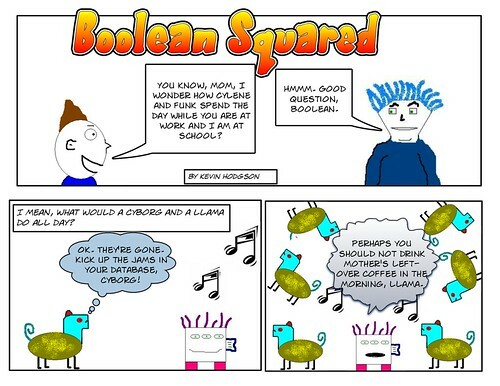 You can read more about Cylene and Funk at my home for Boolean Squared. 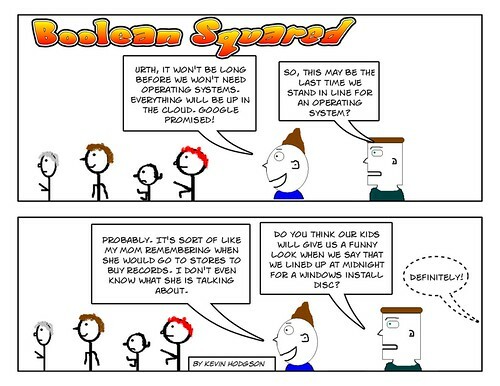 This is my last comic in the Waiting for Windows story. At school, we had a discussion the other day about vinyl records and record players (they are using them in Social Studies for modern archealogical digs and in a novel we are reading, the family buys a portable record player for the car). So, echoes of those conversations filter into the comic today. I found this via Free Technology for Teachers. 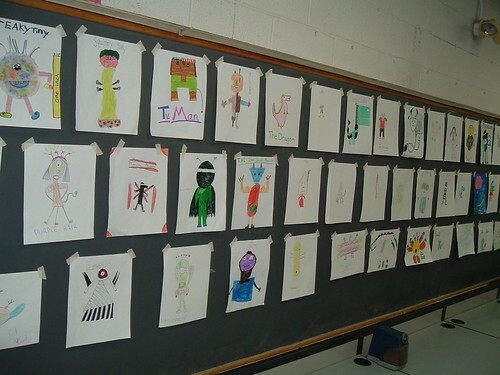 It’s a great overview of using comics in the classroom — particularly online comic sites.